Should large floor-standing speakers always sound better than bookshelf systems? While it is generally true that they do, since a floor-standing design normally has larger diaphragms that can handle musical dynamics easier with lower FMD pollution; yet M&D’s speakers not only challenge this assumption, they prove it is no longer valid. 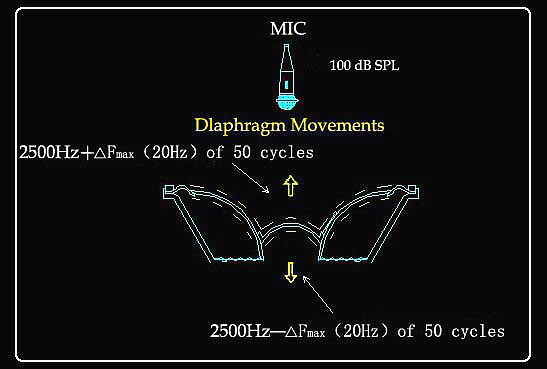 FMD (Frequency Modulation Distortion), or “Doppler Distortion” easier for expression, is an unavoidable physical phenomenon which occurs whenever one diaphragm (cone) carries more than two frequencies to sound. The severity of FMD is normally described as frequency deviation index. For example, when one driver is operating under a certain Sound Pressure Level (100dB, for instance), a low frequency signal (50Hz, bass) may cause a higher tone (2500Hz, mid-range) to fluctuate a little (within ±20Hz range, for instance) due to the cone’s piston (back & forth) vibrations. Based on extensive research, the minimum detectable frequency shift by human ears is less than 1% of one tone signal. Comparing this critical audio characteristic on frequency swing with human dull sensitivity to loudness variations (detectable 1dB, equals 20% difference in acoustic volume power) on the other hand; one can only conclude that human ears are much more sensitive to FMD than to frequency response. Commonly used, the harmonic distortion (HD) parameter has been indicated on most of hi-fi equipment for reference, this harmonic distortion has an integral relationship with the fundamental wave; it may not be truly harmful while the harmonic distortion is under control, which sometimes can even cause a certain ”richness” add to the music during sound reproduction. As a common knowledge, vacuum-tube amplifiers are having much higher harmonic distortion contributes over transistor amplifiers, yet audiophile may still feel comfortable on listening music with vacuum-tube amplifier; this is one good example. However the disharmony contributed by FMD and/or system non-linear distortions can be very irritating to listeners. This is because these distortions play a primary role by affecting our acoustic psychology: the sense of tone quality and the sense of consonance. The FMD’s importance and severity has long been ignored for numerous reasons by speaker designers and engineers! First, Frequency Modulation Distortion is difficult to measure since it is a transit form of distortion occurring even under linear (undistorted) operation range of the speaker. Secondly and most important of all, there is no way for improvement once the design of a speaker system has been completed, even before the production; and 2-way systems are more severely impacted by FMD pollution than 3-way systems due to the fact that a 2-way speaker’s woofer is required to cover a much wider bandwidth. In short, how serious FMD pollution is directly related with the cone movement vs. operating bandwidth requirements while designing the speaker. Under FMD concern, It is definite a disadvantage for one conventional 2-way bookshelf speaker since its woofer has smaller sized woofer yet needs to carry 5 to 6 octave operating bandwidth in a same time; on the other hand, large diaphragm speakers and floorstanders may have better FMD index to cut down the FMD pollution. For a true hi-fi two-way speaker system therefore, to narrow operating bandwidth (by lowering crossover point) for the woofer is a must be! In test groups, those who listen to bookshelf speakers often comment on a feeling of discomfort after a length of time, “a sense of tenseness” may be expressed. However test subjects listening to large floor-standing speakers often respond by saying there is a “transparent” or “wide open sound and less coloration”; especially to those systems with feature an electrostatic planar or horn driver despite of these products may not have the even frequency responses over their operating bands. This is mainly due to the lower FMD pollution performance. Take M&D’s DM-1 driver for example: with a diaphragm 50X larger than a 1" dome tweeter, yields extremely low FMD pollution. Its performance is similar to the electrostatic planar, yet it has a much higher SPL output capability and dynamic output compared to the electrostatic driver. With the Dreams AMT driver, the conventional 2-way crossover from 2500Hz may be cut down to 800Hz or even lower; this ensures that the incorporated woofer has the lower FMD performance in a same time, due to the woofer’s operating bandwidth has also been limited.